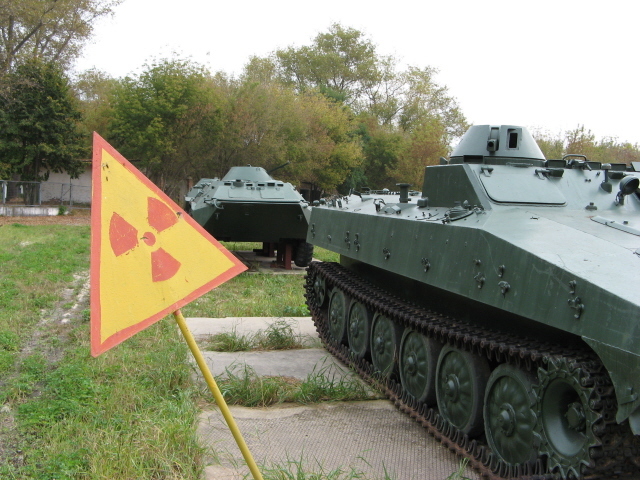 NOTE: despite the troubles in Eastern Ukraine, Chernobyl tours still run as normal. This chapter is about the town of Chernobyl and the Exclusion Zone around it. For the nuclear power plant and the accident that happened there, see under Chernobyl NPP. For the ghost town that once housed the plant's workers, see under Pripyat. 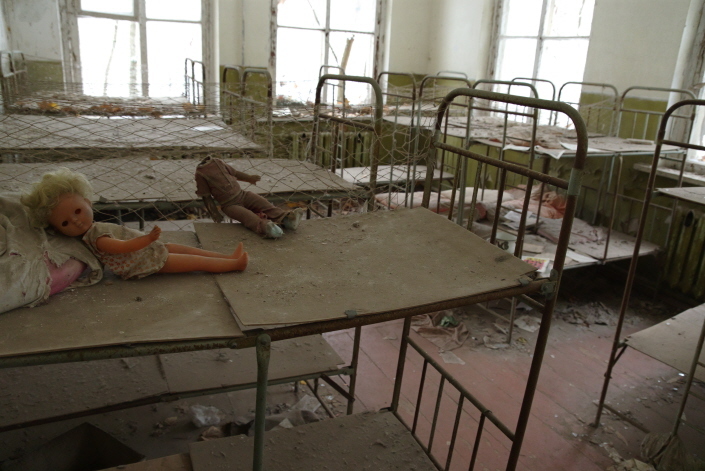 Chernobyl town is the seat of the State Agency responsible for managing the Exclusion Zone. And it is also the base for visitors to the Zone. Here you will be served your meal(s) and if you are on a longer tour than the regular day return trips from Kiev this is most likely also where you will stay overnight. Moreover, there are so many points of interest within the Zone beyond the old NPP and Pripyat ghost town, as well as in Chernobyl town itself, that it deserves its own chapter here. 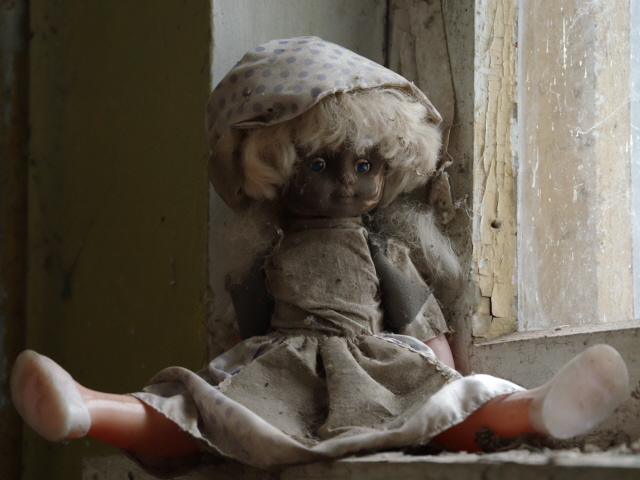 Altogether, a visit to the Exclusion Zone of Chernobyl, whether just a day trip from Kiev or a longer tour, is the very pinnacle of dark tourism in the view of many. And I am anything but an exception. For me it is my very top personal favourite dark destination in the whole world! More background info: For background on the 1986 nuclear accident and its wider context see the separate chapter on the Chernobyl NPP. Chernobyl (or "Chornobyl" in Ukrainian!) was just an ordinary old little village, or small town, in a remote northern corner of Ukraine in the then USSR … until the massive nuclear power plant that took the same name was constructed nearby in the 1970s and early 80s. Its rise to international “fame”, or notoriety rather, came in 1986 after the disastrous accident at this plant. Now the name stands for the largest nuclear catastrophe ever (although Fukushima in Japan has more recently joined the ranks and could equally claim that title). The area around Chernobyl and the power plant has since then become an “Exclusion Zone”, from where all permanent inhabitants (in excess of 100,000!) were evacuated, or evicted, more like. Apart from Pripyat and Chernobyl town, the two largest settlements in the area, this also applied to hundreds of smaller places, villages and individual farms. Most of these former settlements have been empty since then and have fallen into dereliction, just like the ghost town of Pripyat. So it is actually a rather busy place – not the completely dead zone with no signs of life that so many people imagine it to be. There are even shops, bars and a couple of hotels in Chernobyl town. Just no children, and hence no kindergartens or schools – access to the Zone is restricted to adults only! Furthermore there is a lot of wildlife within the Zone. The curse that enforced the departure of humans from most parts of the Zone was actually a blessing for many animals. Many species are positively thriving, simply because they are left in peace by humans. This clearly seems to outweigh any disadvantages due to the radiation levels in the Zone. There are large numbers of wild boar, elk and even wolves and rare wild Przewalski's horses. I have never seen any myself, only their spoor (elk), but I was told that wildlife encounters are quite frequent, especially at dusk. A couple of foxes living in or around Pripyat have even attained a certain celebrity status in recent years … you can find plenty of images of them online and they even feature on souvenir items like hoodies or mugs! And then there are also human returnees. Some of the villagers and subsistence farmers who were driven out of the Zone and into exile in some faceless apartment blocks, where they would remain strangers and often were quite unwelcome, preferred to return to the Zone and resettle in their old homes. At first these “resettlers” (or “self-settlers”, as the literal translation from Ukrainian has it) were of course illegal – and they could be kicked out again if they were discovered. But after a while they began to be tolerated. These days they even enjoy electricity, once-a-week doctors' visits and supplies of things they can't grow themselves. Otherwise they are self-sufficient. And yes, it does mean they grow food on the contaminated land. However, in many places the contamination is actually quite low (the radioactive “fallout” was spread very unevenly – and most of it went into the territory of Belarus!). Furthermore, the resettlers are for the most part very old people, and their reasoning is that it doesn't matter if there's a risk of perhaps getting cancer from the radiation at some point, because the likelihood is that they'll have died of natural or other causes anyway long before it could come to that. 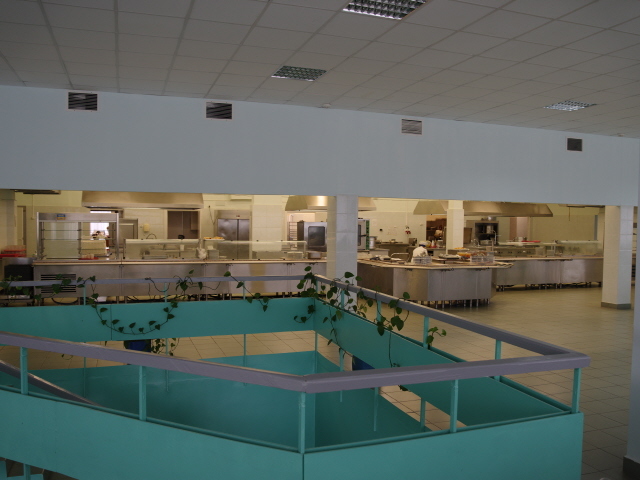 Visitors are frequently assured that the food they are given in the canteen of the hotel (be it just for lunch, for day trippers, or also breakfast and dinner if staying overnight) is “ecologically safe”, meaning: it is all imported into the Zone from the outside. Yet I've heard of people who have dared to try fruit they found growing on trees in the Zone, without getting immediate radiation sickness. Some people working in the Zone even gather wild mushrooms! Namely from areas they know escaped radioactive “fallout” or precipitation. For a Westerner like me who remembers well the warnings back in 1986 and subsequent years that mushrooms were such radiation sponges that one should not eat any that grew in suspect areas (such as southern Germany or all of Poland, Romania or the Baltics), the idea of eating mushrooms growing right within the Exclusion Zone seems ultimately foolhardy. But apparently it's not that simple. What about the general risks of a visit to the Chernobyl Exclusion Zone, then? Well, Chernobyl town actually received less radiation than Kiev, 70 miles (110 km) to the south. That's why it's still such a hub of activity in the Zone. Other places, however, are of course much more affected. The area near the stricken reactor 4 of the NPP is obviously amongst them, Pripyat as well to a degree. Much of the area was decontaminated in the years after the accident, but a few spots (like the courtyard of the school that was inaccessible to vehicles) were left out. Your guide will know best where to tread carefully and where not to go at all. If you want to know more about radiation, what its effects on the human body can be, and how the contamination is spread around the Zone (and outside it), and also about precautions to take, I recommend checking this superb source (external link, opens in a new window)! The guides in the Zone generally say that, overall, a day tour in the Zone exposes you to roughly the equivalent of extra radiation that you would get on a transatlantic flight … proportionally more if you stay longer, of course. But all that is still within tolerable limits. After all, there are thousands of people who actually live in the Zone (often on a two weeks on, two weeks off basis). And they don't glow in the dark yet … UPDATE: I've meanwhile found out that the natural background radiation at ca. 35,000 feet (crusing altitude for many planes) is in fact more than ten times higher than the ambient background radiation on the ground in Chernobyl town! (Simply because on such a flight you are closer to the background radiation in outer space – hence people living at high elevations, such as Colorado, USA, or, say, La Paz in Bolivia, are also constantly exposed to higher background radiation.) And the exposure you get from an X-ray is significantly higher still. Puts things into perspective a bit! There are particular hotspots in the Zone, however, where you should really not linger and should be especially careful. One of the most infamous of these is the so-called Red Forest. This is where some of the reactor's graphite landed after it was ejected in the explosion on 26 April 1986. The leaves of the trees subsequently turned red and some serious deformations were also observed. So they ploughed the whole forest over and covered it with a new layer of soil (on which a new, green forest has since grown). But still. There are so many severely irradiated particles in the ground here that you have to keep car windows firmly shut when driving past. Even on my latest tour in November 2018, the guide's dosimeter still went into alarm mode for the couple of hundred yards we were driving past the Red Forest. Needless to say, nobody should get out here and go for a walk in this forest! Other known hotspots include the old cemetery of Pripyat (obviously respect for the dead ruled out ploughing this over and replacing the topsoil) and a claw used by a crane to lift out highly radioactive material from the disaster reactor in 1986. Somehow this extremely irradiated piece of equipment ended up simply being stored in the open on the outskirts of Pripyat. This items still measures in excess of 300 μSv/h (that's massive compared to the ambient background radiation in most of the Zone of around 0.12 to 0.30 μSv/h). So nobody should go and stay at that spot for long. The Exclusion Zone (or “Zone of Alienation” as it is called in Ukrainian) is actually two zones: an inner one and an outer ring around it. Within the inner Zone lie not only the power plant, but also the ghost town of Pripyat as well as the artificial lake and the fish farm (see below) and the massive Duga-3 installation. Chernobyl town, however, and the majority of the abandoned settlements, as well as the resettled houses, lie within the outer ring Zone. The shape of the Zone does not follow the radius of 30 km (20 miles) from the reactor but is in actual fact quite haphazard and asymmetrical. To the east there is just a narrow band of outer Zone separating the inner Zone from the lands around, while both the inner and outer Zone are much wider to the west and south. To the north the inner core Zone actually borders directly on neighbouring Belarus, so the ring of the outer Zone does not even completely surround the inner core. Before you can see anything at all within the Zone, you have to pass through the checkpoint at the border of the Zone. Your guide/driver will take care of the formalities and paperwork (see under access below). Vehicles are checked and you may have to open any bags you might have brought along. But it is generally a smooth and standardized process. It certainly does serve as an exciting intro, though. You get the distinct feeling that you are about to enter a world quite out of the ordinary. Almost all tours use the main checkpoint at Dytyatky because this is closest to the main road to/from Kiev. It is also here that not one but even two well-stocked souvenir shops have sprung up (selling mostly merchandise from one of the larger tour operators). That's just one sign of how much more tourism Chernobyl is receiving these days. In fact I've seen statistics that evidence an almost exponential growth in annual visitor numbers to the Zone since my first visit in 2006. 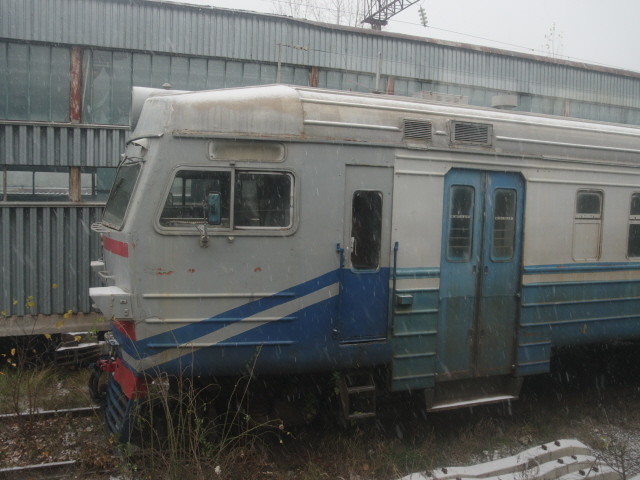 There is one interesting alternative to entering the Zone by road, namely by joining the employees of the NPP and other work places in the Zone on one of the commuter trains that bring them in from Slavutych – the town that was built to replace Pripyat after the 1986 disaster, ca. 30 miles (50 km) to the east. That's the route I took on my visit in November 2018, and it was quite an experience! You can simply board the train – it's free, so no tickets are required. Nor do you need a transit visa when the train passes through some territory of Belarus – the trains never stop en route anyway. 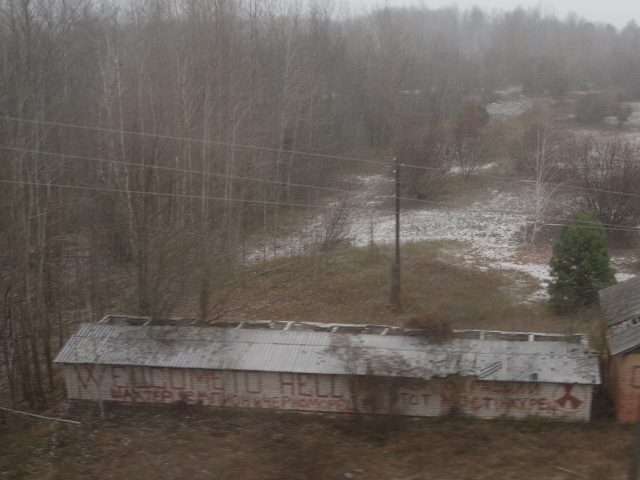 Shortly after crossing the Pripyat River as the train gets near the NPP I spotted a house onto which somebody sprayed the legend “welcome to hell!, together with a crude rendition of the radiation warning symbol. That's an exaggeration, of course, but it makes for a nice contrast to the souvenir shops and coachloads of tourists at Dytyatky. When I was on the train, our small group of three were the only ones who had luggage, i.e. were not just going to work in the Zone. Arriving at the Chernobyl NPP's train station (called Semykhody – but you don't need to know that as it's the terminus and indeed only stop on this route anyway) is also a rather surreal experience. 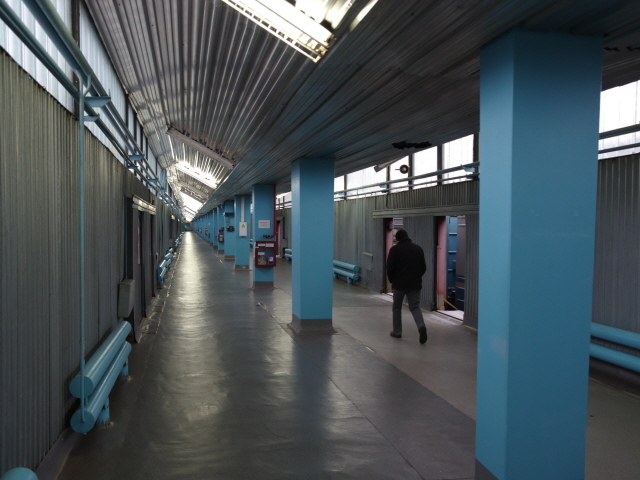 The two platforms are completely covered in metal walls, except for the doorways that match the train's doors so that you can get out. On the platform speakers play announcements and even piped music! 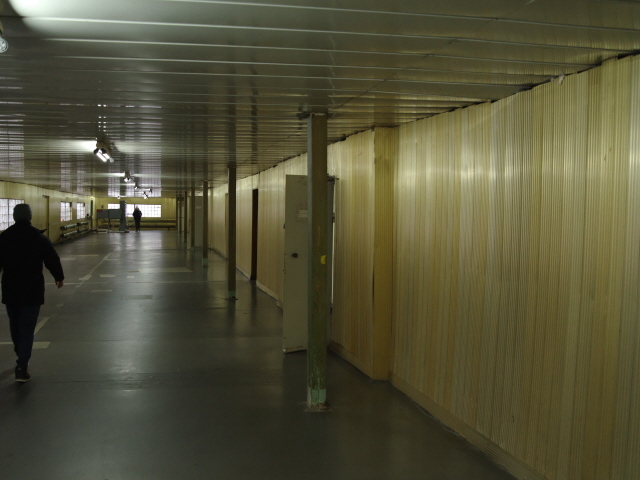 At the far end of the corridor leading to the exit, clad in golden metal just like the NPP's fabled “golden corridor”, is the checkpoint to the entry to the Zone. This is where our guide awaited us with all the required paperwork. 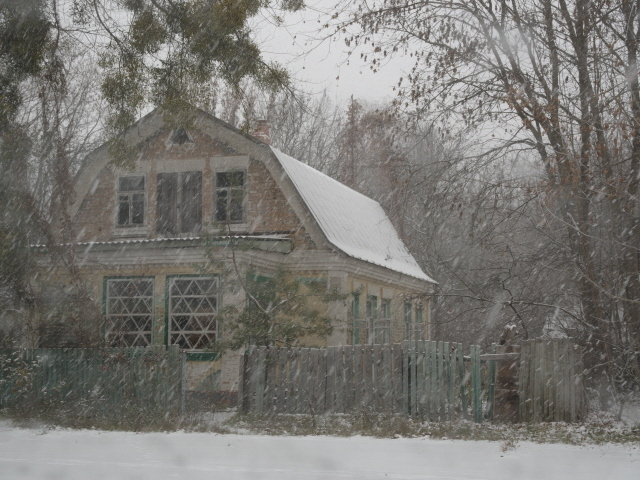 Having entered the Zone at Dytyatyk, tours usually head straight for Chernobyl town first, possibly stopping at some abandoned village buildings en route. You can definitely spot various signs by the roadside that specify ex-settlements' names, basic statistics (such as the number of inhabitants before the evacuation) and a black-and-white aerial photo. There is a memorial complex in the centre of the town that consists of a metal sculpture depicting what looks like an angel blowing a horn and behind it a row of place name signs flanking both sides of a path. These are the names of all the disappeared villages/towns within the Zone. If you look back you see that the signs have the names crossed out in red on the rear – as when you're leaving a place by road. In the centre of the memorial complex is a strange installation called the “post office”. There are several cabinets in which you could, in theory, put letters addressed to these various villages and towns. Most of these cabinets were empty at the time of my visit. Dotted around are yet more monuments, including a strangely exaggerated one that consists of a statue of a man fighting with what looks like a bison (but is supposed to be a bull). The newest addition is a small monument involving two oversized representations of origami cranes made of metal. This is, you will have guessed it, a Japanese monument (paper cranes have become a symbol of Hiroshima and all bad things nuclear in Japan and beyond), presumably erected in the wake of Fukushima. Somewhat surprisingly, perhaps, there is also still an old statue of Lenin looking on, a bit forlornly, as it seems. This is one of very few Lenin statues left in Ukraine, so I was told. Why they left him standing here, I don't know. But it certainly makes for a good reminder that this was the Soviet Union when the Chernobyl nuclear accident happened. Near Lenin is also a large info panel that outlines current projects (such as the new spent fuel storage facility under construction). 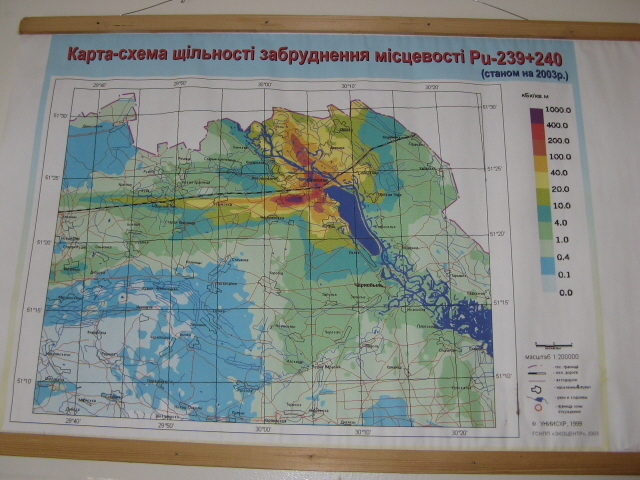 Another has a large map with all the disappeared villages of the Zone. Adjacent to the memorial complex is a building painted with huge dramatic murals, involving the unlikely juxtapositions of doves and nuclear fuel rods that seem to be exploding simultaneously out of a reactor core. On another wall it's storks that dominate (there are indeed many to be seen in the Zone – when it's the right time of year, of course). Inside this building is supposed to be a museum – but as my guide informed me it is closed most of the time, only open on special occasions. He also said that it is very similar in style to the Chernobyl Museum in Kiev, only much smaller. So if you've seen the bigger equivalent (a must-see when in the city) you won't miss out by not visiting this one in the Zone. In a different part of town stands the firefighters monument – a large and dramatic group sculpture that looked like it had been recently repainted, and fresh flowers lay at its base. Also still within Chernobyl town is an open-air exhibition of vehicles and remote-controlled machines used in the liquidation of the exploded reactor. This site has changed a lot. 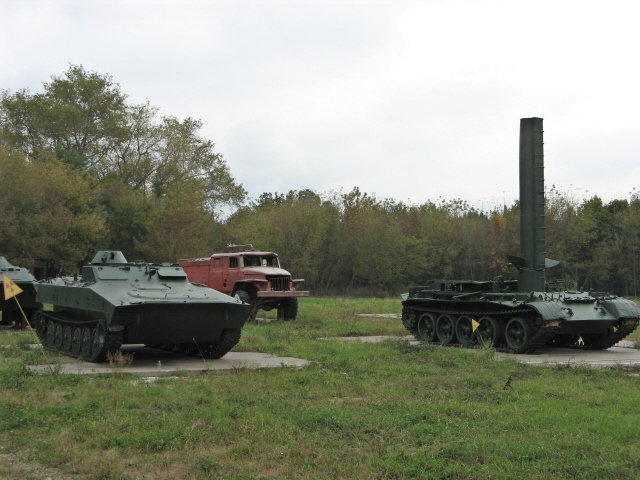 When I first visited Chernobyl in 2006, there were just four large vehicles, including two tanks, one with a strange chimney-like tube on top. Back then you could approach them unhindered (despite a radioactivity sign sticking out of the grass next to them). 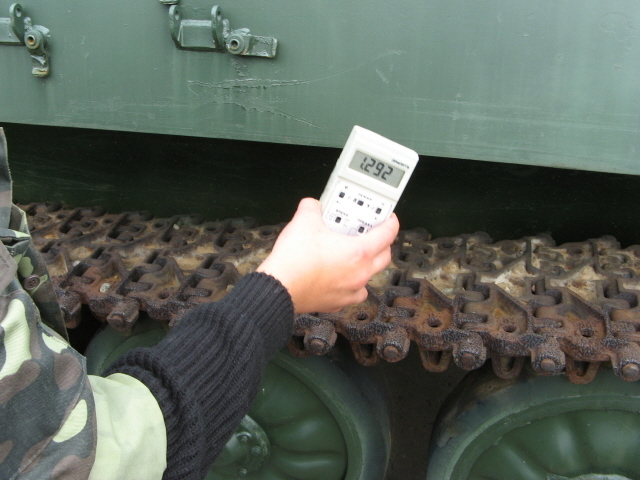 My guide demonstrated the accumulated radiation on one of the tanks' tracks: his Geiger counter's reading shot up like nowhere else where we went in the Zone that time. Now there is a fence separating visitors from the vehicles (though it wouldn't be difficult to climb over – if the guide would let you) and there are several radioactivity warning signs. The vehicles themselves have also changed. The tanks and red fire truck have gone, instead there are plenty of smaller remote-controlled vehicles and robots. One even looks like a moon rover. Speaking of vehicles – what you will definitely NOT see any more at all is the great vehicle graveyard of Rossokha. At this location, in the south of the Zone, there used to be rows and rows of trucks, armoured vehicles and even those huge MiL-Mi-26 heavy-lift helicopters that were used in the liquidation operations (the choppers e.g. for dropping sand straight onto the still burning reactor core). Many of these were, of course, severely irradiated in the process. At one point, however, a visit to this eerie sight was part of the tours to the Zone. But this was stopped a number of years ago. And now the graveyard apparently isn't even there any longer. It has to be feared that all those vehicles were scrapped (possibly even sold as scrap metal to China, as usual … like the irradiated debris of the Semipalatinsk test site). UPDATE: I've meanwhile found that apparently visits to the Buryakivka waste storage facility, where some other irradiated vehicles are still in situ, can on occasions be arranged. The loss of Rossokha, as a sight, is partly made up for by other rusting hulks of metal, namely of shipwrecks in what used to be Chernobyl's harbour, as well as some harbour cranes closer to the power plant. If you're on a longer tour, these locations may be included. The regular day tours probably won't have time for this. Also near there (in the area of the unfinished Blocks 5 & 6) is a more obscure site that, I take it, is very rarely part of guided tours: the remains of what was once a fish farm. It's astounding to think that they had a fish farm right next to a working nuclear power plant. But so it was. These days the pontoon parts that used to float on the lake are rusting away on the shore … while a number of large dead fish were rotting away next to them when I was there. No idea what may have killed them – but it was an unnerving sight to behold ... not to mention having to breathe in the stench. Really interesting, though, was the breeding/spawning centre and laboratory associated with the fish farm. In one room we even spotted jars with samples, some of them holding small fish, others containing unidentifiable clumps of organic matter. Spooky. What is often also part of the tour itineraries, at least the longer ones, is visiting some of the resettlers in the Zone. You can see the rather simple conditions these old people live in. But you are welcome. Of course you'll get a lot more out of such a visit if you can understand and speak some Russian or Ukrainian (they won't speak any English), otherwise you'll have to rely on your guide interpreting for you. On that same tour we also visited a completely abandoned village in the Zone just a few miles south of Chernobyl town, called Zalissya. 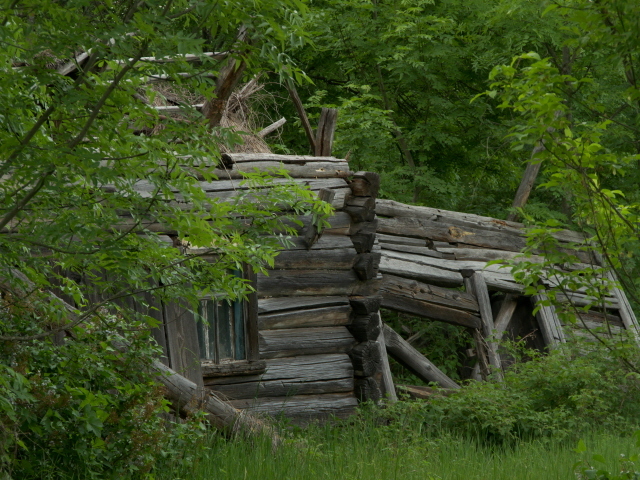 Here, most buildings were completely surrounded by new-growth forest and many had partially collapsed. The former cultural centre, however, a sturdy stone edifice, was still safe to enter. Inside we could see the grand hall – which would back then have been the cultural hub of village life. Now it is empty and lifeless. Yet a slogan proclaiming the everlasting glories of communism was still legible above the stage. 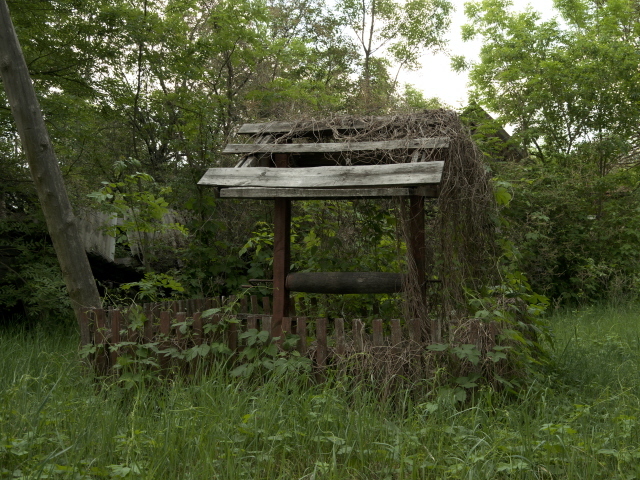 Most of the abandoned villages also sport their obligatory WWII monument. Zalissya too. But there are much better ones to see at various roadside locations around other parts of the Zone as well. A final distinctive component of all visits to the Zone also has to be mentioned: every time you leave the inner or outer Zone border you have to step through a radioactive contamination detection device at the checkpoints. These scary-looking pieces of vintage technology will only let you through if you're given the “all clear” by the radiological readings. It's always a bit of an unnerving process … what if your measurment is classed as “dirty” (that actually is the Russian word for it on these machines) and hence you get a red light and a blocked gate bar? Would they keep you in the Zone? Would they have to decontaminate you? If so, how? Fortunately, I always got through fine at these checkpoint. Only once, on my first visit to Chernobyl, I initially failed to pass a similar test on a smaller device we had to step onto when entering the visitor centre (on our return from Pripyat and the ChNPP, before lunch). This once did give me the red light. But the employee in attendance simply gave the thing a good kick, had me stand on it again, and voila, I was given the all-clear after all. I liked this good old Soviet low-tech approach to problem-solving. The visitor centre in Chernobyl town was also the place where on my first visit we were given a lengthy briefing, involving maps and pointing sticks as well as a video of the liquidation on a computer screen. I was glad that on my latest two visits, which were both private, i.e. just with a guide, not a group, none of this was repeated. The building is also what functions as a quite decent hotel, for those who are on longer itineraries, as well as the restaurant/cafe for employees and guests alike. On regular day trips from Kiev, this is where you'll likely have your lunch included in the tour price (most tours do). And if you are on a tour of two or more days and stay at the hotel, you'll have breakfast and dinner here too. See below for more on this. UPDATE: it has become more common these days for visitors to be steered into the canteen where the workers of the NPP also take their lunches. It's logistically more convenient for many itineraries being, as it is, much closer to the plant and also Pripyat. Don't expect any culinary wonders here, but it is quite an experience. ADDENDUM November 2018: on my most recent tour one thing that was added by my guide was a stop at what was Kopachi village. This place was one of the villages closest to the disaster-stricken NPP and hence got seriously irradiated. So the authorities decided to bulldoze all wooden houses and buried the debris there and then in big heaps. This proved not such a good idea in the long run, as the soil remains pretty highly contaminated (as our Geiger counter reading confirmed – it was one of the highest we measured on that trip). Apart from a few concrete kolkhoz buildings, only the former kindergarten was left standing. 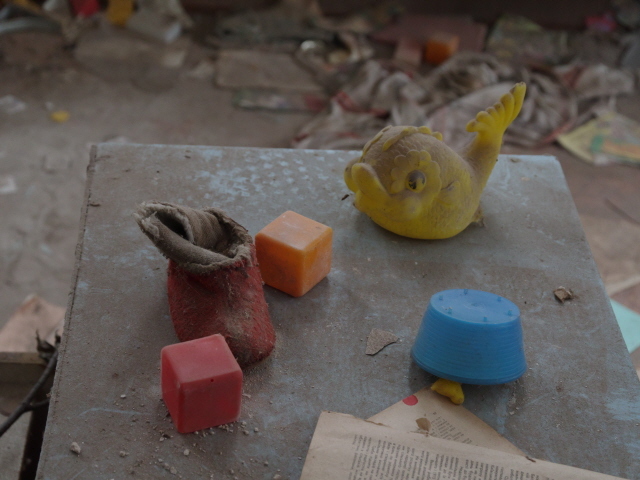 We went inside and it was quite an eerie atmosphere amongst all those left-behind toys, little shoes, dolls and rows of tiny beds. By the road, Kopachi's WWII memorial monument is a landmark too. All in all, it cannot be overstated that a trip to the Exclusion Zone, with Pripyat, the NPP and the Duga installation as special highlights, is amongst the coolest things you can do as a tourist on this planet! No wonder it is such a much talked about classic of dark tourism. For me it is the undisputed No. 1 of all the many hundreds of dark-tourism sites I have been to. And I doubt it will ever be beaten. Location: in the north of Ukraine, close to the border with Belarus, and about 70 miles (110 km) north of Ukraine's capital Kiev (from where all tours to the Zone start). Chernobyl town is (now) the largest lived-in settlement and it is located in the southern part of the outer Zone, about 10-15 km south-east of the ex-nuclear power plant. Here are the Google maps locators for the specific locations mentioned above (though you won't need them for navigating yourself when visiting the Zone, as that is necessarily down to your guide anyway). Access and costs: restricted and regulated, but not difficult to arrange (in advance! ); quite expensive on a private or small group basis, much less so with a larger group. Details: There seems to be a bit of confusion about whether or not, or how, you can visit Chernobyl. So let's sort it out clearly. Yes, you can visit Chernobyl. And it's not a new thing. Tours have been running for many years, since at least the late 1990s. In recent years they have become so popular that these days some 50,000 people visit Chernobyl annually, and the trend is still growing. But NOTE: you cannot just waltz in. You have to get a permit in advance – and that is easiest obtained by going through a tour operator. There are now quite a number of competing tour operators, some offer more or less the same and are basically just agents who cart tourists to the Zone, where they are guided by an official guide employed by the State Agency administering the Zone. These guides are basically obligatory in any case. Where tour operators vary is not just in the prices but also in the range of different types of tours they have in their portfolio. It is in this respect that some stand out much more than others. But you have to know what you want. If you really want to get the most out of your visit, consider a multi-day trip. 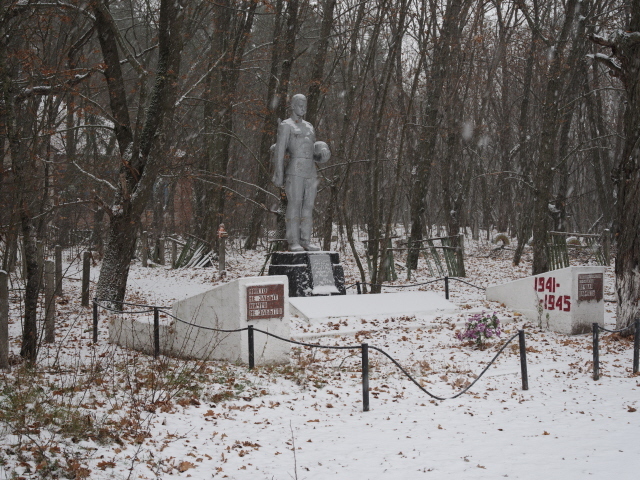 By far the majority of visitors, however, only “do” Chernobyl on one of the regular day return trips from Kiev. All of these tend to incorporate a few standardized items, including the main square and the funfair at Pripyat and a short stop at the NPP, possibly also a glimpse into some buildings (e.g. the swimming pool or the school), and of course Chernobyl town and its monuments, and possibly a few extra items. Some elements may vary from tour to tour and the order in which they are done isn't fixed either. Much depends also on which guide you get. UPDATE: please NOTE that officially you are no longer allowed to enter any of the abandoned buildings in the Zone. Yet some tour guides still do take clients into certain buildings. This is at your own risk and you should be discreet when doing so, i.e. keep quiet and don't otherwise draw attention towards yourself. In general follow your guide's advice. See also more on this under Pripyat. 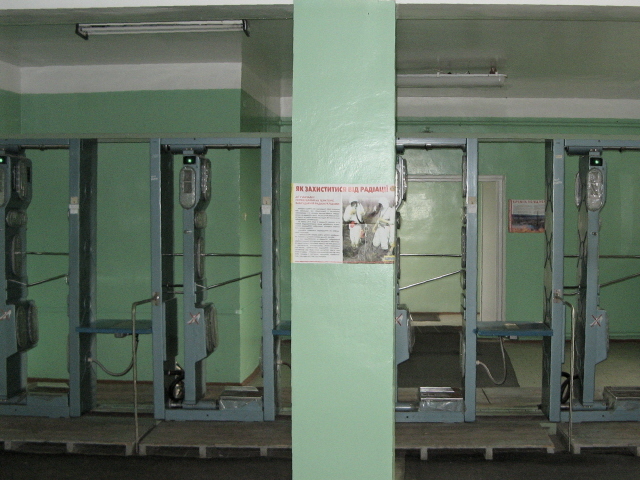 Several operators also offer longer tours that include one or more overnight stays in the Zone, typically in the hotel/guest house in Chernobyl town (though at least one operator also offers accommodation in their own cottage). The advantage of a longer tour is obviously that you have so much more time to explore beyond the usual standard programme. But if you're content with just a taster and a glimpse of the most important highlights, then the day tours are fine. At the other extreme end of the scale are programmes of up to a week – aimed primarily at enthusiast and professional photographers. Tours run year-round, some operators have fixed schedules, others are open to arranging dates of tours as the client wishes. Whatever you choose, it is advisable to start planning well ahead of time. In addition to allowing an informed choice, you also have to factor in at least a week or two for the paperwork to be processed. The tour operators will arrange that for you, but the State Agency responsible for the Zone requires such processing time. In theory you could also try and approach them directly, but not only would it take considerably longer to get a permit for an independent visit, it's also not worth the hassle (and it may not be granted anyway). Better shop around thoroughly to find the best tour and operator suited to your requirements and budget. Prices vary widely. If you're prepared to join a large group (like a coachload of 30 or 40), then starting prices for a day return trip can be as low as ca. 75 USD per person (at least that's the lowest I've ever seen – the more common baseline is rather around 100 USD). Smaller groups naturally push the per-person price up, as do the longer programmes including overnight stays in Chernobyl. Completely private tours of that sort can cost well over a thousand (or even a few thousand if staying several nights). A small group is a good compromise. From around ca. 300 USD per person you can get a pretty decent one- or two-day arrangements. But of course you'll have to add to this getting to Kiev and accommodation there before and after the tour. Some tours have fixed departure points where groups meet (e.g. at the train station in Kiev), others offer to pick you up at your hotel. Departure from Kiev is usually quite early in the morning to maximize available daylight time in the Zone. Driving time from Kiev to Chernobyl is about two hours on average. So the return journey alone takes four hours out of the day. Add the lunch break, briefings and waiting time at the checkpoints, plus extra driving time within the Zone, and you'll see that a 12-hour day tour will leave you with just four to six hours or so to actually explore places in the Zone. That's still not bad, but if you stay over in Chernobyl for even just one night you much more than double the time available for explorations. As for which tour company to recommend. Well, I am a bit hesitant to pick out specific names of individual Kiev tour operators publicly here – but if you contact me I can give you some hints directly. Regulations, restrictions, rules: not everyone can visit the Zone, and there are certain rules that have to be followed. First of all, no under-18-year-olds or pregnant women are allowed in the Zone. That's most probably just a precaution, as radiation is potentially more harmful to foetuses and children than it is for adults. Next, you have to wear suitable clothing. That doesn't mean radiation-protective rubber suits or anything that extreme. (There seem to be some misconceptions around concerning this aspect too.) But you do have to cover your arms and legs – so no shorts or T-shirts, or sandals, no matter how hot the weather may be (when I went in May 2015 it was nearly 30°C so it did mean it got a bit sweaty). The rule is only strictly enforced at the Chernobyl NPP and the viewing points around it, elsewhere in the Zone it may be more relaxed. But it is a good idea also because long sleeves and trousers provide protection against the undergrowth that you will invariably have to traverse at some stage. With regard to radiation, remember this: the risk from radiation is a function of level of radiation, your distance from the source of radiation AND the time you spend there. In short: you don't want to be near highly radioactive places for long. But a short moment won't do much harm. The main thing is not to ingest, inhale or otherwise take along any irradiated particles. Therefore, eating, drinking, smoking is not allowed when outdoors in the Zone. Drinking water in vehicles is fine and food will be supplied indoors anyway (see below). But don't walk around munching sandwiches or anything. If you follow these rules, then exposure is over once you leave. Otherwise you might end up taking it home with you in the form of particles inside your body. In general you should also watch closely where you walk: not only are tarmac or concrete surfaces safer with regard to radiation (whereas vegetation accumulates it – moss, in particular, is a real radiation sponge) you're also less likely to trip or stumble into any sudden holes. If you are allowed inside any abandoned buildings, be very careful where you tread – floorboards may have become weak and hazardous and things might dangle dangerously loosely from ceilings. In general: follow the instructions and advice of your guide! Most importantly, avoid breathing in dust at places of elevated radiation. Some people actually take masks to wear over their nose and mouth – just in case. Also avoid touching anything. Again, if you want to be extra careful, consider taking light gloves. You may also consider wearing old shoes that you can ditch afterwards. Some visitors even plan to lose their outer clothing layers (I did the first time, but not on subsequent visits), though normally just giving them a thorough wash after the tour should be good enough. For obvious enough reasons do not take anything out with you from the Zone. It may be tempting to pick some bit of original debris as a kind of memento, but really: stick to the official souvenirs. There are in fact quite a few on offer these days, both through many of the tour operators and also on site at the administrative office and at least at one hotel in Chernobyl as well as by the Dytyatky checkpoint. Speaking of hotels. There is indeed visitor accommodation within the Zone. I stayed at the place simply called “10”, which is also where meals are served. There are apparently alternatives, such as an older, more basic Soviet-style guest house, as well as a private log cabin-style guest house nearer to the main entry checkpoint to the Zone. But I can only report on the hotel I stayed in. You can't expect a full-service hotel of Western standards here, of course, but I found the accommodation perfectly decent. The bed was fine, the bathroom facilities worked, so did WiFi, and there was even a TV in the room (I never switched it on though, so I can't say what channels it would have had). The restaurant of the hotel is also for employees working in the Zone, but on a Sunday there was hardly anybody else about. At lunchtime on Monday it was far busier. The employees appeared to be choosing from a menu, but hotel guests get served fixed set meals food. 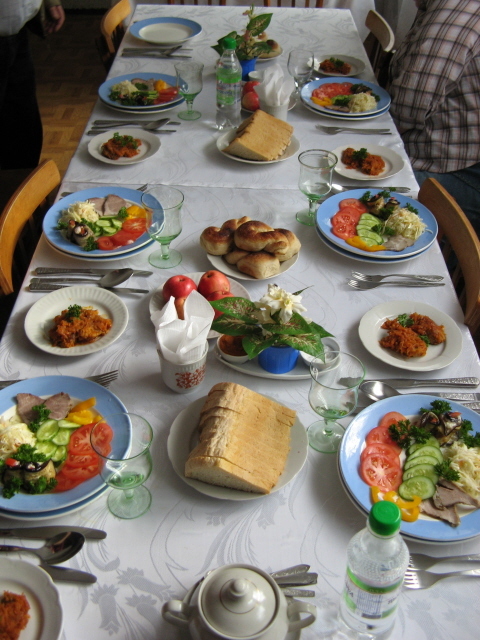 The cuisine is firmly Ukrainian – and ample. Soup, main course, salads, sides, desserts – often far too much to finish. Heavy, stodgy, calorific fare. Vegetarians beware: you can arrange for meatless food, but you may still find bits of bacon or chicken floating your soup (presumably because it's not thought of as meat if it comes in those forms rather than as a big hunk of meat). The soup broth is unlikely to be properly veggie anyway. So if you are a strict vegetarian check what's put in front of you first. Vegans … well, you might go hungry … or take your own emergency supplies. UPDATE: when I was back there in November 2018, the hotel was clearly well booked and the restaurant was almost full both in the evening and at lunch time, and this time mostly with other foreign visitors. The restaurant also serves alcohol, though strictly only between 7 and 9 p.m.; yet that was enough for a group of ca. eight Brits at a neighbouring table to turn it into a veritable boozing session that got increasingly noisier as the evening progressed. I've also read several times that apparently such merry evenings are quite common here. I was a bit more restrained myself, but what I had to try was the special beer they sell at this bar: it has its own dramatized Chernobyl-themed label (with an image of the exploded reactor and a liquidator's helicopter accompanied by some garbled English descriptive text). The label claimed it was strong, 11% abv, but to be frank it didn't taste much different from a regular lager beer. There are even shops within the Zone, if you need to stock up on anything (drinking water most likely, but you can also get cheap booze). To be on the safe side, though, already buy your water supplies en route from Kiev. The hotel only supplied a small bottle of water each with meals and one for the night. 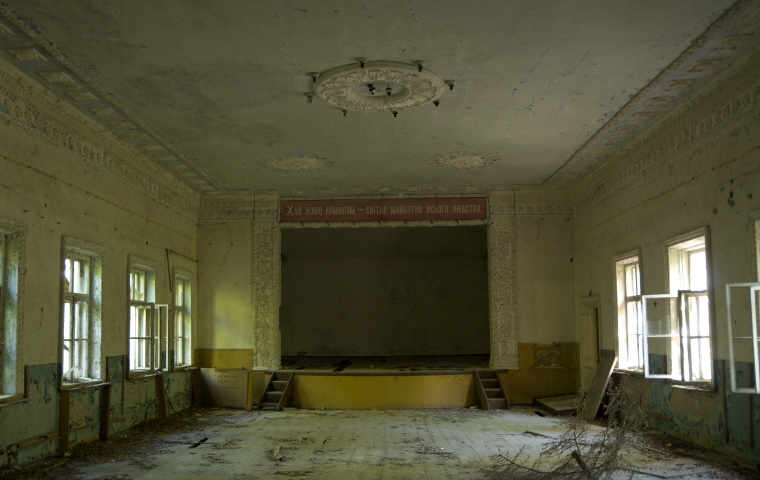 There are apparently also a few regular bars around for the locals in Chernobyl town (but there's no other entertainment, like cinemas or so) … though I wonder how their operation tallies with the after-dark curfew I was told about. Anyway, you are unlikely to want to wander around Chernobyl after dark – and you, as a visitor, are definitely not allowed to do so in any case. Photography: obviously, Chernobyl is a photographer's dreamland of the very highest order, especially for those with a penchant for urban exploration and all things Soviet. For the most part you are free to take pictures anywhere, with a few exceptions at the Zone checkpoints or near the Chernobyl NPP (they are particularly touchy about their security fence and gates being in any photo's frame!). One general rule that can make some shots tricky is that you are not supposed to place any photographic equipment on the ground or rest it against any objects. So a steady hand and often high sensitivity levels will be required where available light is low. Or take a tripod – though that can also turn into a burden/obstacle when clambering around. Time required: one day minimum (including transport from Kiev and back), or up to a maximum of a whole week (extreme!). Most visitors make do with the single day. But two or three days allow for a much more in-depth visit. Longer than that is only for “extremists”. Combinations with other dark destinations: Given that all tours start and end in Kiev, exploring this city for a few days is an almost obligatory add-on to any Chernobyl tour. Out of the many things that Kiev has to offer, one is a must-do for anybody interested in Chernobyl – Kiev's official Chernobyl Museum! Quite a few of the tour operators that specialize in Chernobyl also offer day tours from Kiev to the Pervomaisk former nuclear missile base, so that's a worthwhile combination to consider. What I did on my return trip in November 2018 was the combination with Slavutych, primarily in order to get the train into the Zone the next morning (see above), but my guide also arranged for a visit to the local museum, which is mostly about Chernobyl and the disaster there in 1986, so that was a worthwhile add-on. Combinations with non-dark destinations: Who needs anything non-dark when going to Chernobyl?!? And yet, it is fair to say that the Zone also offers plenty of pretty scenery – and even the chance to spot wildlife! (cf. background!) So it's not all just dark and grim. Even though it mostly is, of course. On the edge of Chernobyl town you can even find a pretty blue-and-white Orthodox church – the only functioning church in the Zone, I was told. It looks like a picture-book perfect Ukrainian cliché, and elsewhere it might have been a real attraction. Here it is rather an oddity amongst the eerie aura of the Zone (and probably offers respite from just that to those who use the church). For real mainstream tourism, Kiev remains the most obvious and convenient combination. Kiev is the starting point for day trips to Chernobyl anyway – so it's a good idea to spend some time in that fascinating city too. It is in fact well worthy of a visit in its own right. Personally, I find it one of the most captivating capital cities I've ever visited (it's certainly in my Top 10 of cities worldwide! ).